You’ll want to go off the beaten track. In Sedona, beauty surrounds you, but for up close, personal and jaw-dropping sights created by nature, you’ll want to go off the beaten track. With more than 200 trails covering 300-plus miles in the Sedona area, it’s easy to find a new path to wander. What’s hard is deciding which path to take. Whether hiking, biking, walking or running, there’s a route for you. Check ‘em off on Doe Mountain Trail where switchbacks ascend a mesa with 360-degree views of Bear, Maroon, Mund and Wilson mountains; Loy, Boynton Sycamore and Secret canyons; Chimney Rock and Cockscomb formations. You’ll agree it’s well worth the effort. (1.5 miles; 2 hours) Note: All distance and time estimates reflect round-trip excursions. Meanwhile, Centennial Trail, a paved 1-mile trail, delivers many of the same visual rewards, including the Red Rock Country basin, the Cockscomb formation, Bear, Doe, Mingus and Secret mountains. Go late in the day and watch how the setting sun changes not only the sky but also the majesty of the landscape, then stay for the stars. Arches are where it’s at as evidenced by the crowds at Sedona’s famous formations, but you can avoid the masses and still get in range of iconic archways. Fay Canyon Trail, an easy stroll with rewarding views, passes by the Fay Canyon Arch—keep a keen eye along the right edge of the canyon wall hiking in, otherwise, you might miss it. The 2.3-mile trail only takes about an hour, so consider going late in the day. On your way back, spread out a blanket to stargaze at the opening in the trees near the trailhead. If you’re an adrenaline junkie, who prefers to peddle the paths, many trails allow mountain bikes. Consider Aerie Trail, a short, shady loop with rewarding views; or Deadman’s Pass a fast track with a touch of every terrain type. For more ideas, check out Sedona’s Secret 7 and the USDA Red Rock Ranger District trail list. Rent equipment and get beginner-to-advanced trail information at Over The Edge. 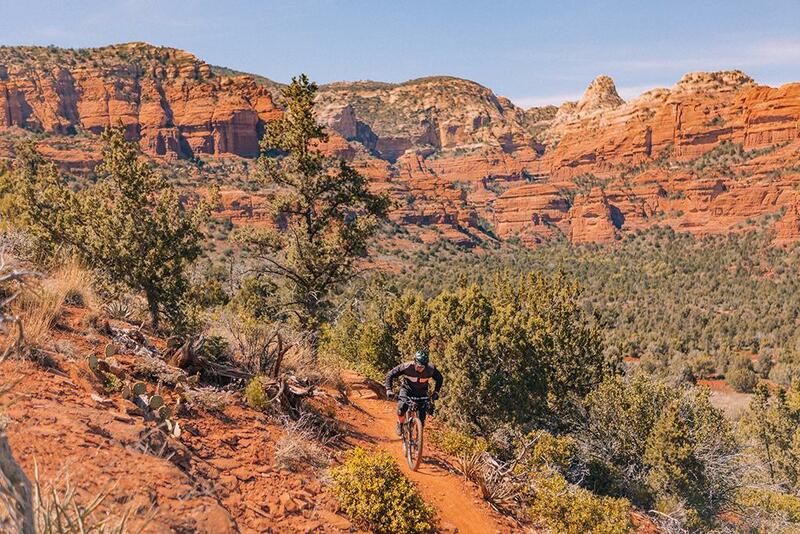 Their cycling experts will likely recommend Bell Rock Path for beginners, a host of intermediate trails like Mescal and Chuck Wagon, and for an advanced ride, bike Hiline or Hangover trails. To see both flora and fauna, roam the trails at Red Rock State Park, a 286-acre nature preserve. Bring your binoculars because it’s home to many bird species. Wednesday and Saturday Bird Walks with an Audubon Society guide begin in March and continue through the year on select dates at the park. Or visit Amitabha Stupa & Peace Park, where the peaceful environs of this 14-acre Buddhist retreat (open to all faiths) attract migrant and breeding birds. The saddle of Cathedral Rock emits the greatest energy but getting there is difficult. There’s also noticeable energy just below Cathedral Rock at Buddha Beach along Oak Creek off the Templeton Trail (a large collection of creek-side cairns marks the spot). See Cathedral Rock and Templeton trails above. As you climb up Courthouse Butte Loop Trail toward Bell Rock, between the 10th and 11th rock cairns, turn right toward the large flat rock shelf and make your way to Meditation Perch. Then, sit on the ground and, well, meditate or flow through a few yoga poses. Feel another spiritual energy at Chapel of the Holy Cross, where a new corpus crucifix will be unveiled this spring. Avoid the crowded parking area at the top by parking below and hiking up the hill to see this 33-foot bronze statue that weighs more than 4,000 pounds and has taken sculptor James Muir more than two years to finish. This installation is a sight to see. 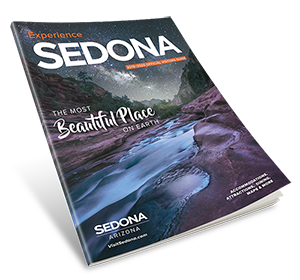 For more inspiration, Sedona’s Secret 7 offers suggestions for hiking, biking, stargazing, picnicking and more. The Hike House’s interactive Trail Rating System details distance, duration, elevation change and difficulty ratings for 101 trails. Also, visit the Ranger Station to purchase a Red Rock Pass and gather plenty of useful information. If you’d prefer to let someone else do the planning, book a guided outing. Find guides and other Sedona things to do here.